First up Kate Beckinsale shimmered in a mermaid like chrome fishtail style dress from Zuhair Murad. I love everything about this look including the minimalist accessories which allows the dress do the talking. Emma Watson went for the shock factor which I am sure will have the fashion world divided. A dress and pants on the red carpet, who’d have thought it! I think it works and suits her quirky fashion style. Emma wore a Dior Couture dress over a pair of simple black cigarette pants. I’ve included Zooey Deschanel in my favourite looks from the red carpet as I love the girly style statement she is making. The shimmering ivory Oscar De La Renta gown oozes femininity complete with flower in hair. Finally, Taylor Swift was certainly one of my best dressed picks. Going for a more demure, chic look in a Carolina Herrera strapless gown in her favourite colour. I was surprised how many of the stars opted for red this year! I am really looking forward to seeing Taylor Swift on tour in February in London!! Do you agree with my picks? 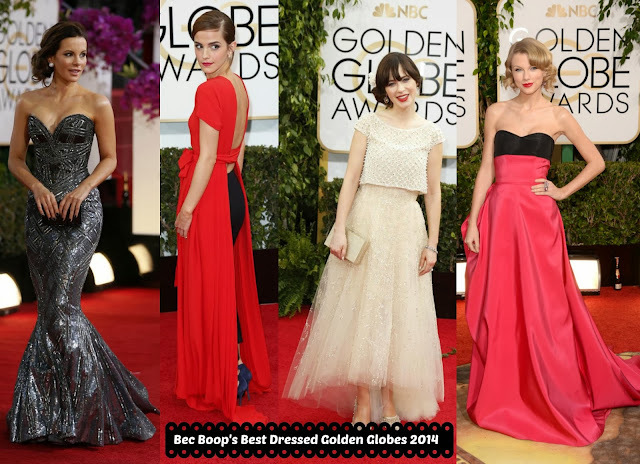 Who was your Golden Globes Best Dressed this year?